Condo associations similarly cannot prevent you from installing solar energy products on your property. Unfortunately, the roof of a condo and the areas outside your walls are rarely considered your property. Courts have upheld this law in favor of homeowners to a great extent. The law event extends to clotheslines that use the sun and wind to dry clothing, again, as long as it is on your property. The railing of your porch is not generally considered your property. Homeowner associations can tell you where to put solar panels as long as it does not impede the function of the panels. Typically you will want your panels to be on the south side of your home, and there is little a homeowner association can do to stop you. Most homeowners want to maintain a good relationship with their association, management company, and neighbors. 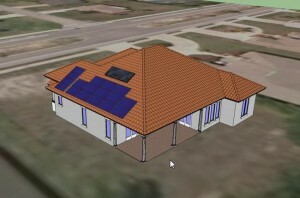 What I do to help smooth things out is prepare a 3D model of the home on a Google Earth map to show the association board of directors how the finished product will look. Our solar advisers discuss options with the homeowner and quantify the effects of suboptimal panel placement on roof faces. In just about every case we can come to a suitable resolution that makes all parties happy. If push comes to shove, a strongly worded letter citing Florida Statute 163.04 is the ace up our sleeve. If your homeowner association is giving you a hard time about installing solar panels on your Florida home, let me know! Next Post: How Much Power Do Solar Panels Make?